Too often the world speaks words of harm, and too often we believe them--and so we live stories God never intended for us. Yet God longs to rewrite and redeem your story. Tiffini Kilgore, founder of the lifestyle and design boutique House of Belonging, grew up in a broken home before marrying at the tender age of sixteen. Years later, divorced and with three small children, she remarried. The seasons that followed brought two more children, another broken marriage, chronic disease, major surgeries, and cycles of abuse--leaving Tiffini feeling alone and unloved. Hungry for healing and a safe space, Tiffini began seeking Jesus through journaling and soon found bread crumbs of grace leading her down a new path. 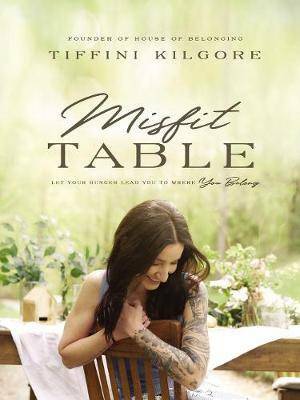 There, she found a rich table set for misfits just like her--a place of nourishment and restoration. Where she was fed lies of worthlessness, God fed her truth that she was his treasured daughter. Where she was told she was a helpless victim, God offered her the cup of his strength. Where she once held an empty future, God gave her hope and a fresh start. In cultivating an ongoing dialogue with her Abba Father, God transformed Tiffini's pain into passion, and ultimately, fierce belonging. Tiffini writes as a modern-day mystic, with lyrical force and deep tending of the soul, in this book for anyone who has ever felt out of place or at odds in the world. Each chapter features compelling narrative as well as a poignant response from Papa God as Tiffini calls him, and the result is a stirring invitation to come home to where you belong. Come and sit, take and eat, and join the battle cry to take God at his word.